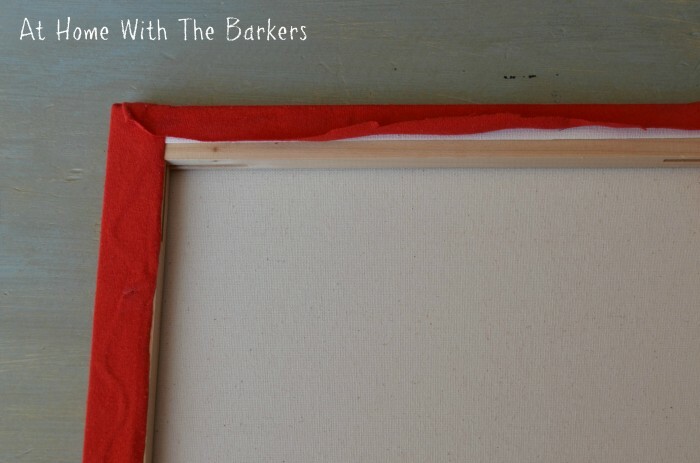 I like cheap and easy projects that don’t take a long time to complete! Dylan had just cleared out his closet so we had a bag full of T-shirts to choose from. You can see about our de-cluttering here and here. I told him to pick out about 4 shirts for this Easy T-shirt art and I would see which ones looked best. No surprise to me he stuck with exactly what represents him most! I had already bought the canvas because I like to have them on hand. I picked them up when they were 50% off at a Hobby Lobby but you can always find a 40% off coupon and get them any time. I laid the T-shirt out with the canvas inside of it so I could see exactly how I wanted the finished art to look. Then I took a bar of white soap to mark on the fabric where I needed to cut. I learned this little soap trick in a sewing class I took years ago. 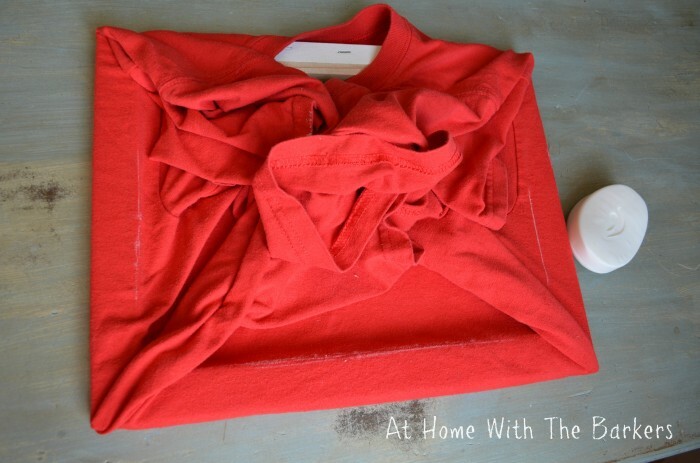 Super easy because it will wipe off with a damp cloth. 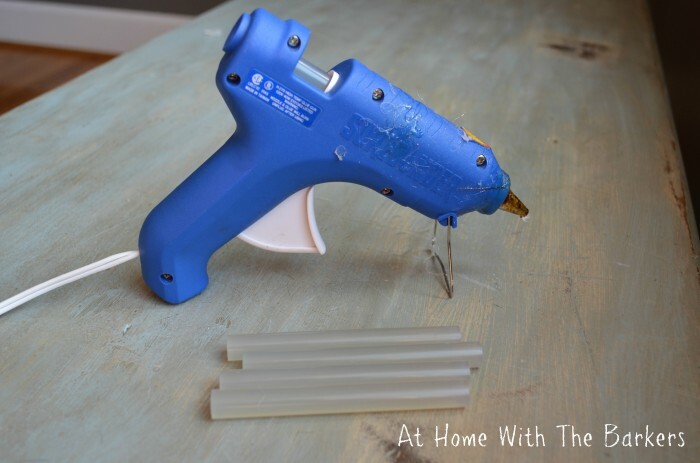 Once I had the T-shirt cut to size I plugged in my hot glue gun! AND just glued it down to the back of the canvas. Just like that, Easy T-shirt Art! You can see progress of my son’s room here. I will have the entire room posted soon and you will see this art on the wall! To see the gallery wall that included this art go here. Do you have other great ideas for T-shirts? I would love to hear them! Share in the comments! 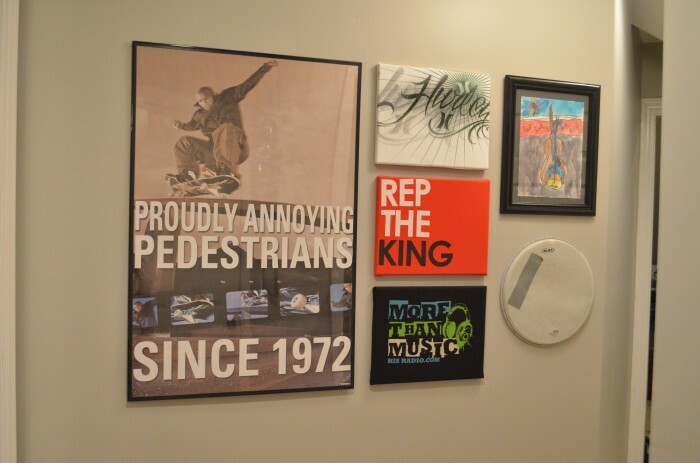 I have more gallery wall art projects if you are interested in creating your own. I too like easy, fast projects. I need almost immediate results. 🙂 I love this idea. And I also love his choices. They look great. I can’t wait to try some. It was super easy. My son helped! 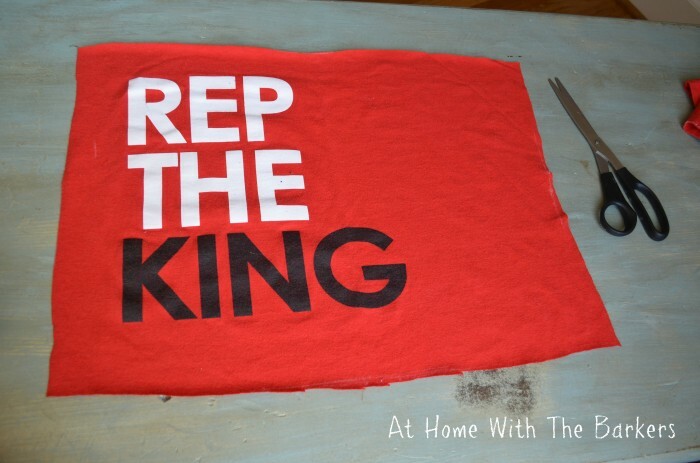 I loved that he wanted REP THE KING on his wall!! Thanks Alice! That is a great idea for your youth!! I would love to see pictures of that! This is so genius! I’ve been working on my son’s room as well and this is perfect! I am so grateful you shared this…thanks IG friend 😉 @familybringsjoy Pinned it! Thanks so much for your sweet words and sharing it! Can’t wait to see what you come up with! Sonya, this is amazing!!! I am so thrilled to be neighbors with you at Life in Bloom today. Wow, I am not crafty–but I love this . .and I think I can really do it! My boys would love this! Thank you! Thanks for your sweet comments! I’m heading to your blog now! This would be soooo cool in a teenager’s room…or a rec room. Great job, Sonya. Thanks for being #101 in my linky party. Hope to see you next week! 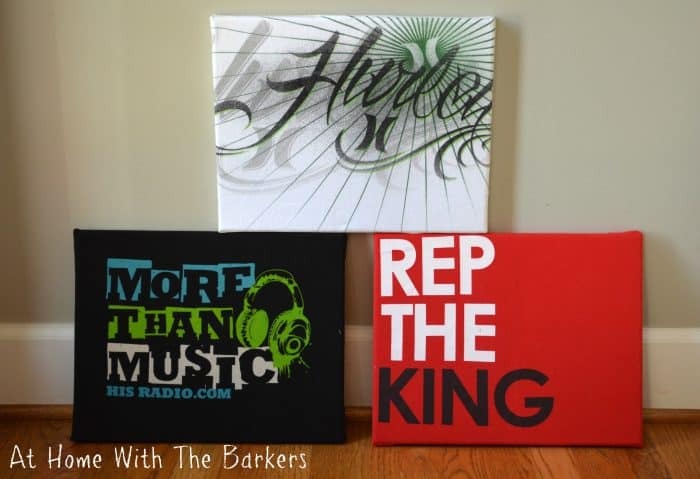 This is part of my teenage son’s wall art for his room redo! I love how well it turned out! I love it! I think this is a cool way to create a little bit of memorabilia for when the kids get older, too. Thanks for sharing the soap trick, I’m going to use it! I’m Lovin this! You are such an inspiration! I will be pinning this! Oh that is just totally cool! I will have to make some out of my son’s old t-shirts for his room!! Love this! Thanks Nancy! It was so easy and I like that my son helped! Genius, brilliant, awesome! I love these! 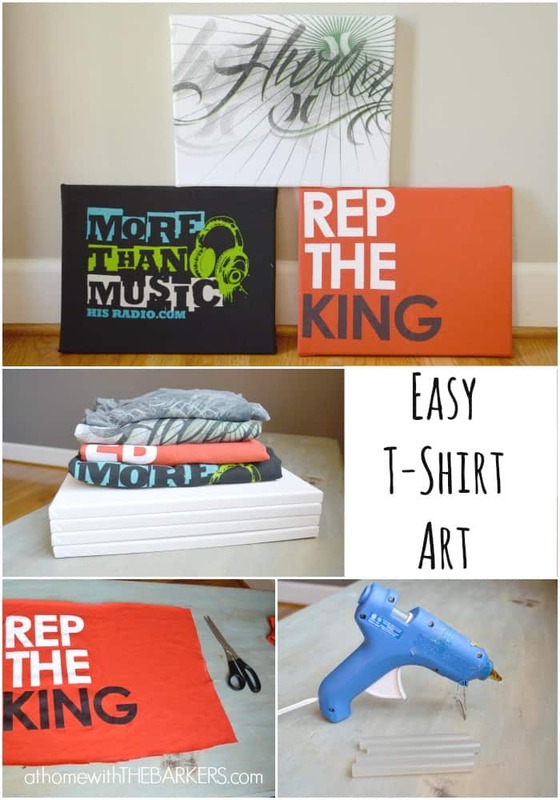 What a great way to use those t-shirts to make some amazing artwork! Thanks so much for partying with us at Time to Sparkle Tuesday! Thanks Liz for the kind words! I’m excited to join your party! I think these are just genius! I love how easy and fun they are! THAT IS SO GREAT!! Thank you Liz, I’m honored! Love this idea!! My kids have so many sentimental tshirts that I was going to have a large quilt made out of but they have soooo many that I can’t get them all on it soooo perfect that I can put some on the walls now!!! I love your site. Thanks for sharing. I love this! My husband has a ton of old concert T-shrits from a particular band he likes – our sunroom is decorated in that style and these will be perfect! Mostly because he doesn’t wear a Medium Tshirt anymore! Thanks! 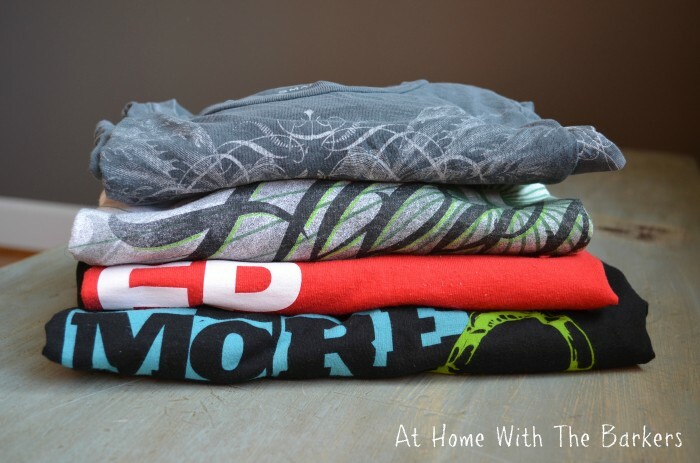 This is a great idea for old t-shirts! My husband also has old t-shirts from concerts and none of them fit now! I need to remember this as another way to display them in his den! I also took a few old shirts and made them into pillow cases for him. I have pictures and directions on my blog at http://www.homelifejourneys.com. Thanks for sharing another way to use the rest of them! 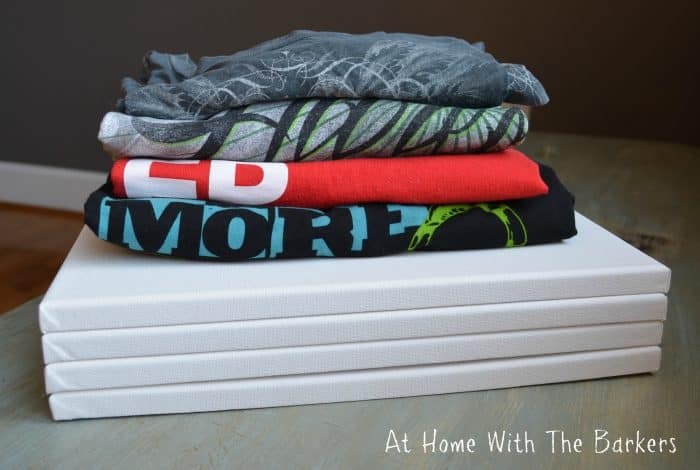 Love the idea of using canvas – so much easier than cutting foam core. Plus I had forgotten about the soap idea. I also remember that from years ago. A little hint – I don’t buy bar soap but often pick up the small bars in a hotel to take to our local shelters. Next time I will have to stash a couple of them back in my craft supplies. Great idea for those small soap bars!